Lake Geneva Film Club screens A Christmas Carol, Tuesday, Dec. 18, 2018, 7 p.m.
See the 1951 film starring Alastair Sim, widely considered to be the definitive movie version of Charles Dickens’ classic novel. Sim plays Ebenezer Scrooge, a London miser who, despite his wealth, refuses to make charitable contributions and treats his sole employee, Bob Cratchit, as an indentured servant. On Christmas Eve, Scrooge is visited by three ghosts and taken on a tour of his life only to realize what a wretch he’s become. 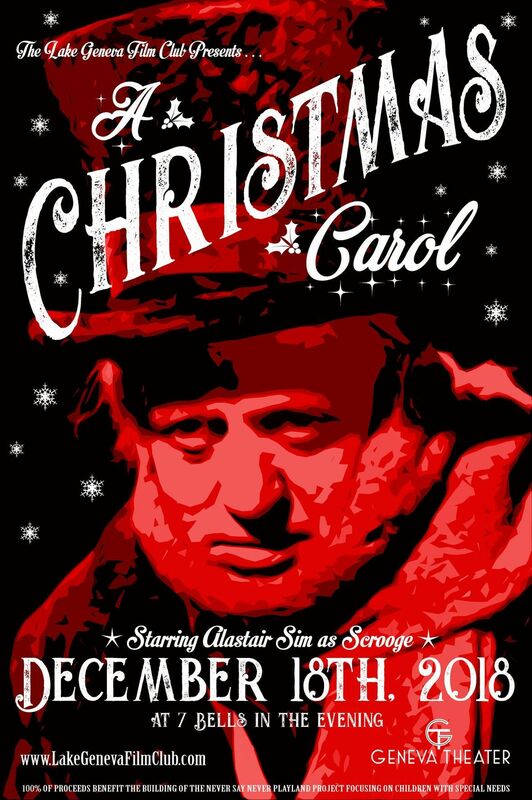 Scrooge sets about earning his redemption with an overflowing of Christmas charity and cheer. Don’t forget, this month’s showing is on a TUESDAY, December 18, at 7pm. Rated G.